We carry the most complete line of roof flashing tapes and roof flashing products. Flashing tapes are exterior grade UV protected tapes for long-life flashing and roof repair. Popular products include Eternabond roof repair tape, Karnak Butyl Sealant Tapes, TRA-Mage Flexible/Expandable Tapes, economical U-Seal tapes, Protecto Wrap flashing products, chimney flashing, corrugated roof flashing, metal roof flashing tape, tile roof flashing, barrel roof flashings and window flashing products. They are available in aluminum faced, painted aluminum faced, EPDM rubber faced, TPO plastic faced, and expandable metals. Sealant adhesives include butyl rubber sealants, synthetic sealants and asphalt rubber sealant. Colors include terra cotta, white, gray and charcoal black. You'll find our quick shipping & discount prices are unbeatable. A-Seal: Aluminum faced for aluminum trailers, corrugated roofs, patio roofs & metal roofs. Doublestick: Makes gaskets or efficiently seals any two materials. Resistant to many acids and alkalines. Not resistant to gasoline and petroleum solvents. EternaClean: Spray cleaner for all roof types. EternaPrime: For low temperature applications, priming corroded metal, dirty roof surfaces, for enhanced adhesion or other old roofs. RoofSeal Black: For all roof leaks and underlayment repairs. RoofSeal Gray: For all types of gray colored roofs. RoofSeal White: For all roof leaks, RV roofs. RoofSeal Plus: Double thick sealant for irregular surfaces, granulated roofs, cap sheets or over fasteners. UV Protector/Eternashield: Use together with Webseal for UV protection of Webseal product. Webseal: Fabric reinforced faced, for seam or joint repairs when a coating will be applied. Commonly used for metal roof seams. Can be used under ANY type of roof coating / roof repair product for long lasting reinforcement. NEW: See our helpful RV Roof Repair, and our RV Re-Roof & Roof Replacement Tips. Viisit our Roof Repair page to see the latest roof repair techniques (bottom of page). A-Seal / Alumibond has the same aggressive sealing qualities as RoofSeal, but has an aluminum backing laminated to Eternabond sealing adhesive. The aluminum backing is 4-mil thick aluminum sheeting, not 2-mil foil like most tapes. Consequently, A-Seal requires no UV protection and can also be painted to match the repaired surface color. A-Seal is perfect for truck trailers that have been cut or simply need resealing over seams and rivets. It is also perfect for storage tanks, corrugated roofing, steel and aluminum roofs, etc. A-Seal is standard in rolls 50' long. RoofSeal is the best solution for leak repair or corrosion protection in tough environments and conditions, including EPDM Roofs, RV roofs, land-fill and pond liners. The specialized backing has proven to be UV stable, even after 16 years in full sunlight. Eternabond's patented adhesive has an integrated primer which allows RoofSeal to BOND with the surface it is installed on. Perfect for reseaming all roofs, regardless of the material. Rubber, EPDM, fiberglass, aluminum, modified, shingle, PVC, steel, hot-tar, etc., RoofSeal makes a permanent water-tight seal. Elongation factor greater than 700% guarantees RoofSeal will flex, expand and contract in all conditions, even on liners! Can be installed to -20 degrees F (with EternaPrime). Sag rating of over 250 degrees F. 10 year warranty. Also great for tank repairs. Utilizing its advanced MicroSealant technology, EternaBond continues to provide permanent waterproofing solutions for a variety of commercial roof repair applications. RV roof repair, flat roof repair, mobile home roof repair, metal roof repair, steel roof repair, tile roof repair, rubber roof repair, and repair of roof shingles all suffer from the same problem - leaks eventually occur and are difficult and expensive to repair. Eternabond adheres to most surfaces, including EPDM rubber roofs and all storage tank materials, virtually on contact. Eternabond has an elongation capability of up to 500%; so as the surface it is bonded to changes shape, Eternabond changes with it - without losing its grip and without losing its seal. 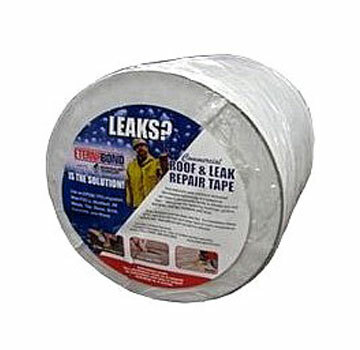 This makes Eternabond perfect for virtually all leak repairs!